ATTENTION RISING 2ND & 3RD YEAR MEDICAL STUDENTS our hospitals and practices these days. As someone who tiptoes on the tightrope between busy-ness and burnout, I needed the reminders. And I suspect many of you are in that same boat. Wouldn’t it be great to go back to those first days of medical school (OK, if we could do it without the studying part) and recapture that joy and excitement about medicine? It’s still exciting most of the time, but as I’ve said before, we all too often get diverted from our patients by the process of punching data into computers, begging insurance company permission for tests and medications, answering e-mails, choosing the right codes, meeting “meaningful use,” ensuring that Press Ganey thinks at least 97.352% of our patients are “satisfied,” and staking part of our compensation on patients who won’t take their medicine, never exercise, and pay for their dinner by the pound at the Golden Corral buffet. This is the part of “Living the Dream” where you wake up, run to the window, and yell to anyone who will listen: “I’m mad as hell, and I’m not going to take it anymore!” Well, your Academy is not being content just to “take it.” The NCAFP and AAFP are working on many of these issues. We think we are the key to improving healthcare in this country, to controlling costs, to helping our patients stay healthy. We think if we take care of the doctors who, as Paul Grundy says, focus on protecting the fish who are still in the lake, we won’t have to spend so much rescuing the ones who wash over the dam. I’m happy to report we are making progress, but there is much more to do and we need all the help we can get. Many of you already are active in the Academy, but if you aren’t, we have a place for you. Get involved! I could go on, but I’m afraid I’ve already exceeded my word limit. So, of course I have to close with a movie reference, this one from Captain Phillips. Electronic medical records and computers are here to stay, which mostly is a good thing, but in my clinic, and perhaps most clinics, they often get between the doctor and the patient. Sometimes the patient is actually BEHIND me on the exam table while I’m tasked with clicking boxes and linking orders. I fully expect that, one day soon, a patient is going to get frustrated, grab my arm, spin me around and say, “Look at me …. LOOK at me … I am the captain now! !” Remember that. Remember who the “captain” is, why we went into this profession, and where we need to steer this ship. If we can do that, maybe we can keep those “pirates” from hijacking our joy and excitement! Preparing for Accountable Care Organizations A little over a year ago, Governor Pat McCrory proposed transitioning the state's Medicaid program to private managed care organizations (MCOs) as a way to ensure budget predictability. Those MCOs would have contracted with the state, on a per capita basis, to provide care to Medicaid beneficiaries. In a little over a year and after continued talks with the administration and the Department of Health and Human Services, the proposal to reform Medicaid now does not include MCOsâ&#x20AC;&#x201D;instead the "m" has been replaced with an "a." The shift to ACOs is a step in the right direction and will change how healthcare is delivered to Medicaid beneficiaries, but what does it mean for family physicians? based medicine, report internally on quality and cost metrics, coordinate care for beneficiaries, emphasize patientcenteredness through individualized care plans and transitions of care, and aim for whole-person care. ACOs will play an important role not only in Medicaid reform, but also in value-based payment reform. As the NCAFP advocates for reform at the General Assembly, it is imperative that family physicians position themselves strategically for change, even if ACOs are not ultimately enacted for Medicaid. There are several concrete strategies family physicians can employ to prepare for this new accountable model of healthcare. How can Family Physicians prepare? The Family Physicians ACO Blueprint for Success - www.ncafp.com/aco-guide The Physician’s ACO Toolkit - www.tac-consortium.org Elements to Achieve Accountable Care - www.pcpcc.org/guide/better-best ©2011 Smith, Anderson, Blount, Dorsett, Mitchell & Jernigan, L.L.P. physician would need to be successful. By the time it is time to join an ACO, family physicians will already have transitioned their skillsets and resources to work in this new delivery environment. through the action of our members. By working on the things mentioned in this article family physicians can position themselves to be invaluable to any ACO and demonstrate to legislative leaders that they are ready for the transition. While it may seem like family physicians must align or create an ACO immediately, you don't have to act right away. Working on data collection, care coordination, and population health management will ensure your best position for the future. Familiarize yourself with the tools needed and perfect your methods before you embark on building this new model. And when it's time to build—you will be ready. * Dividend payments are declared at the discretion of the MAG Mutual Insurance Company Board of Directors. Since inception, MAG Mutual Insurance Company has distributed more than $136 million in dividends to our policyholders. Insurance products and services are issued and underwritten by MAG Mutual Insurance Company and its affiliates. North Carolina’s twelve allopathic family medicine residency programs had another strong year in the national allopathic resident MATCH. North Carolina’s allopathic community- and university-based programs filled all 91 of its available residency slots, with nearly 99% doing so on the first round. Compared to the state’s results in 2013, NC’s allopathic programs MATCHed at a higher percentage (98.9% vs 91%) and filled more total positions (91 vs 88). NCAFP Vice President Dr. Rhett Brown of Charlotte was one of over 40 Academy leaders to attend the strategic planning session in Pinehurst. Over forty NCAFP leaders gathered in Pinehurst in early March for an important strategic planning session. The session was facilitated by Cecilia Sepp, an executive with Association Laboratory, a national consultancy that specializes in the development of business strategy for associations and non-profits. Sepp began the planning by reviewing a number of key NCAFP member needs as identified by the 2013 NCAFP Member Needs Assessment. With these in mind, NCAFP leaders then participated in a series of round-table discussions to generate a list of strategic and tactical goals. In the coming months, NCAFP officers will utilize these goals in drafting a new strategic plan for the Chapter. It is expected that the draft of the new plan will be presented to the NCAFP Board of Directors this summer. 1) Filled (3) positions through 2014 Osteopathic Match. NCAFP Delegation Completes a Busy Two-Days of Advocacy on Capitol Hill Fourteen representatives from the NCAFP went to Washington, DC, in early Apil as part of AAFP’s annual Family Medicine Congressional Conference. After briefings on key national issues facing the specialty and some issues training, NCAFP’s delegation met with twelve members of North Carolina’s congressional delegation. Visits were held with Senator Richard Burr and Representatives Mark Meadows, Patrick McHenry, George Holding, David Price, Richard Hudson, Mike McIntrye, and Walter Jones. The group also met with staff representatives from several additional offices. In each of the meetings, the delegation discussed several key issues, including the need for increased payments for primary care, asking for the support for extending the Medicaid-to-Medicare parity payments and Teaching Health Centers programs, and funding for Title VII and AHRQ. In a related development while in Washington, NCAFP Past President Dr. Allen Dobson (1998), President & CEO of Community Care of North Carolina, testified before the US Senate’s Health, Education, Labor and Pensions Committee’s Subcommittee on Primary Health Care and Aging. In a meeting entitled, ‘Addressing Primary Care Access and Workforce Challenges: Voices from the Field,’ Dr. Dobson testified about the need for increased primary care pipeline investment, including accelerating payment reforms, supporting and building capacity in rural areas, and expanded multi-payer efforts. NCAFP Past President Dr. Robert E. Gwyther, MBA (2002), was the recipient of this year’s Frederick B Glaser Award, an award honoring Dr. Glaser, one of the pioneers of addiction medicine in NC and the country. Glaser had a distinguished career in the field of substance abuse, including the study of opiates and alcohol. Dr. Gwyther was noted as a pioneer and leader in the field of addiction medicine, including his work in making significant contributions through education, clinical work and in the community. In addition to his Academy service, Dr. Gwyther has been an active member of the NC Society of Addiction Medicine, and the NC Physicians Health Program. He also served on the NC IOM’s Substance Abuse Task Force that made recommendations to the NC General Assembly in 2009.
medicine, internal medicine, pediatrics, and geriatric care. the patient centered medical home care delivery model and continuing to work with new technologies and processes designed to improve the health of our community. approved for 20 AAFP Prescribed credits. Participants who enroll now through June, 2014, can participate in an interactive series of webinars being held each month (they began March 26th) that will review the learning session and enable learners to collaborate on how to improve child oral health in your primary care practice. For additional information and questions on the course and its collaborative learning sessions, please contact Cameron Graham, Activity Director, at cameron@camerongrahamconsulting.com. The course is a partnership between the NCAFP, the NC Pediatric Society, the NC DHHS Office of Rural Health, Community Care of North Carolina, and the NC Foundation for Advanced Health Programs. To access the course, simply visit http://oralhealth.ncafp.com. State of the Academy As chapter president in 2013, the progress the NCAFP made in advancing Family Medicine can best be summarized in two words: embracing change. There are several strategic areas where your physician leaders and our Academy staff was able to adapt to a changing environment and bring about positive outcomes. What follows is a description of our key successes. our presence in the halls of the General Assembly and wherever healthcare policy decisions are being made. All of these efforts helped us reach a key strategic goal: an effective and respected voice within important legislative, executive, and health policy arenas. Another key area of focus in 2013 has been building new partnerships. Because NCAFP members serve different kinds of patients in many different ways, the NCAFP's links across the health spectrum are critical. These links help family physicians maintain an active role in improving care delivery, but also enable our Academy to spread the message that the specialty of Family Medicine is at the forefront of transformative change. To that end, our Academy continued to actively represent the specialty on over thirty existing state healthcare policy groups and improvement initiatives. We also invested time in establishing the specialty as an active leader in new groups and efforts. For example, our Academy was a key participant on an emerging oral health collaborative working to establish a statewide network of dental homes for children. We also actively positioned Family Medicine within the payment reform discussion, especially with groups like the Towards Accountable Care Consortium. We worked closely with the NC Medical Board as they updated their policies on prescribing controlled substances, and also had a lead sponsorship role in AHealthierNC, an innovative healthy lifestyle and improvement effort. to best meet the needs of our members. The NCAFP delivered a great deal of member education designed to provide the right learning at the right time. Our Academy developed and launched two online Maintenance of Certification Part IV programs while we continued to present an excellent series of annual conferences that are the envy of many state AAFP chapters. We began to offer new tools to make mobile learning easier and laid the groundwork for our DOT certification workshops that have been extremely well-received by members this spring. Finally, we put helpful employment resources into the hands of our residents. Simply put, assisting our members with professional development is changing and requires more than the didactic lectures of the past: it's interactive, informational and on-demand. Preparing for Tomorrow The final effort I'll describe is probably the most important for our members. Last year, our Academy conducted our first member needs assessment in almost a decade. More than 370 NCAFP members responded and the results were eye opening. While we found that advocacy for the profession and our patients remains the most critical role we play for our specialty, changes in the practice environment are creating new demands. The practice arrangements of our members today are vastly different than they were when we conducted our last needs assesment, and this is impacting the information, support and types of education NCAFP members need and desire. The Academy is continuing to use this data as we work to update our strategic plan in 2014 to best reﬂect the needs of our family physicians across the state. My experience serving as your President can best be described as a 'whirlwind tour' and one I will never forget. It was an honor to represent you, speak for you, and fight for you as my fellow family physicians. Fighting for You and Your Patients 2013 ushered in some of the most intense advocacy efforts ever undertaken by the NC Academy of Family Physicians, with the ultimate goal of improving care for your patients and ensuring that the practice environment for family physicians in our state is a positive one. It’s not been an easy undertaking, but working together we’ve accomplished much in the last year. The game changed greatly with a new administration and a proposal for a major overhaul of North Carolina’s Medicaid program, with the threat of outside managed care companies taking center stage. Your Academy reacted and reacted strongly. We undertook a major campaign to ensure that North Carolina physicians continued to make decisions about North Carolina healthcare. Entitled “Our NC Healthcare” the effort included a new web presence, social media activities, a series of press releases and editorials, and most importantly a significant presence on North Carolina’s leading public policy talk show, NC Spin. The efforts also included numerous meetings with Governor McCrory and his healthcare policy team, the Department of Health and Human Services Secretary Aldona Wos, MD, and her leadership team, as well as the outside consultants the department hired. Our activities, combined with those of other medical and healthcare organizations, made a significant difference in the ongoing debate throughout 2013 and into 2014. Our Advocacy efforts didn’t end with the fight for a patient-centered, physician-driven Medicaid program. Your Academy’s leadership has also stepped up efforts in numerous areas, including advocating for the value of primary care and the importance of the continuous and comprehensive care provided by family physicians. These efforts have occurred with both public sector and private sector payers, culminating with an hour and a half live presentation of NC Spin at our Annual Meeting in December. This live presentation was edited for television and ultimately aired twice on their public policy television show in early 2014. Another key issue in 2013 focused on an effort to preserve patient safety and prevent fragmentation of care, while at the same time increasing patient access to needed immunizations. The ultimate outcome allowed pharmacists to provide five immunizations to adults under a written physiciansupervised protocol, as long as the pharmacists check the state immunization registry, include any given immunizations in the registry, follow a specific agreed upon screening questionnaire, and report back to an individual’s primary care physician if the person has one. If the patient does not have a primary care physician, the pharmacist is required to provide information about the importance of a medical home. Flu vaccines remained more ﬂexible as they previously had been, and other adult immunizations can be provided by a pharmacist but only with a specific written prescription from a physician. As we move into the future, we know these enhanced advocacy efforts will be needed even more. As a result, your Board of Directors voted to put the resources into place by using a limited portion of our financial reserves in 2013-14 and increasing our financial contributions toward advocacy in 2014 and beyond. This led to the hiring of an in-house Director of Government Affairs, Joanna Spruill, JD, in October of 2013, while maintaining the services of our long-time government affairs consultant, Peyton Maynard. The bottom line: in 2013, the NCAFP continued to put your needs and the needs of your patients in the forefront of our activities. Whether it is advocacy or continuing medical education, the NCAFP will continue to be there to help you traverse the pitfalls of a global transformation of healthcare at the local, state and national level. Stay tuned. • 105 total contributions from 71 different people totaling $11,990. • Six campaign contributions to five different candidates totaling $6,000. • 21 Forerunner members at the end of 2013, each contributing a minimum of $100 per quarter. Large Chapter Active Member Retention: NC tied for 2nd place nationally at 96.7%. Chapter Market Share: NC placed 3rd nationally at 85.6%. New Physician Retention: Nearly 93% retained their membership. Resident-to-Active Conversion: Chapter acheived 85.1% conversion rate. Resident Membership: Achieved 100% Resident membership for the ninth consecutive year. The Chapter produced five educational programs in 2013 that presented a total of 87.5 AAFP Prescribed Credits. Diagnosing & Managing Alpha-1 Antitrypsin Deﬁciency in Primary Care – Chapter Lecture Series - Part I: Lectures at all chapter meetings and at the Georgia Academy summer annual meeting. Mastering Valuable Hands-On Procedures – Part IV: Conducted workshops at NCAFP 2013 Midsummer/Sports Medicine Symposium and Winter Meetings, and Georgia Academy’s Winter meeting. Team A: The Evolution of the Anticoagulation Management – Performance Improvement Collaboratory: This is a grant project developed by the California Academy of Family Physicians who requested that the NCAFP recruit physicians and practices participate in the program. Members participating in 2013 were Karen L. Smith, MD, and Shannon Dowler, MD. Participating practices assessed their readiness to change, employed a series of “small tests of change,” and made measurement improvement in at least one mandatory clinical measurement. The NCAFP provided administrative support, including reporting and participated in monthly calls, reporting on progress of team members as well as benchmark and evaluation measures. Contemporary Perspectives in COPD: A Family Physician’s Practical Guide to COPD Chapter Lecture Series – Part I: Conducted lectures at several regional AFP chapter meetings aimed at recruiting five chapters. The chapter is also working in joint sponsorship with Consensus Medical Communications (CMC) in developing educational content relevant and valuable to family physicians. New Insights in the Management of Fibromyalgia: Reﬁning the Response of Patients to Individualized Treatment – Chapter Lecture Series – Part I: Conducted lectures at several regional AFP chapter meetings aimed at recruiting eight chapters. NCAFP is working in joint sponsorship with Consensus Medical Communications (CMC) to develop CME content. Improving Adherence and Maintaining Remission in Major Depressive Disorder – Chapter Lecture Series – Part I: Conducted lectures at several regional AFP chapter meetings aimed at recruiting eight chapters. NCAFP is working in joint sponsorship with Consensus Medical Communications (CMC) to develop CME content. Maintenance of Certiﬁcation Part IV Project – Comprehensive Screening for Maternal Depression and Infant Toxic Stress: Second of five MOC Part IV projects under a grant supported by Federal CHIPRA funding through Community Care of North Carolina. 2013 North Carolina Family Physician of the Year Robert Earl Lane, MD, FAAFP - Hertford, NC Inspired at a young age by his own family doctor to pursue a career in medicine, family physician Dr. Robert Earl Lane of Hertford, NC, was recognized for his remarkable 40+ year medical career. He has been Perquimans Countyâ&#x20AC;&#x2122;s only family physician for more than 37 years. Dr. Lane obtained his undergraduate degree from Mississippi State University, finished medical school at Tulane Medical School, and completed his residency training in 1972 in General Practice. He went on to found Coastal Carolina Family Practice in Hertford in 1987, growing it into the largest family medicine group within 100 miles Hertford. Dr. Lane resides in Windfall, NC, with his wife of 30-years, Chris. The Lanes are the proud parents of five children and grandparents to nine. Financial Summary The following represents the 2013 year-end financial summary for the NCAFP Academy. This Summary is only a part of the complete financial statements examined by Thomas, Judy & Tucker, P.A., Certified Public Accountants. The complete Financial Statements are available to any member of the North Carolina Academy of Family Physicians, Inc. upon request at the NCAFP headquarters. 2013 Corporate Membership Program – The following organizations contributed at least $1,000 to the Foundation and were named corporate members for the year: • Blue Cross and Blue Shield of North Carolina Foundation • Johnson & Johnson Services, Inc. • Mag Mutual Insurance Company • Medical Mutual Insurance Group • NC Academy of Family Physicians Medical Student Endowment Fund - The endowment now totals $1,030,646. The Academy contributed $8,485 to this fund in 2013 in addition to the $10,000 contributed to the Foundation’s Tar Wars Program. The Annual Foundation Silent Auction – This event generated revenue of $15,378, with expenses of $6505 for a net gain to the Foundation of $8,872. An increased profit of 30% over the 2012 Silent Auction. Student Activities Family Medicine Interest Groups - The Foundation supported all Family Medicine interest groups with funding and staff support. Financial support totaled over $22,000.00 directly to FMIGs and/or students and included the following: support to off-set FMIG annual banquet costs, student attendance at the AAFP National Conference for FM Residents and Medical Students, the ability to bring National-level speakers to FMIGs and support to help students attend the NCAFP Annual meeting in Asheville. Family Medicine Student Leaders - The Foundation provided $6,780 in support for elected Student Leaders to attend Board Meetings. Leaders include the Foundation Board Student Trustees (2) and the Student Director and Director-Elect. Family Medicine Rural Health Externship Program - A two-week program offered in partnership with Hendersonville Family Medicine Residency Program. The residency program provided leadership of the experience, as well as funding in the amount of $13,500. The Foundation provided an additional $3,000.00. Ten students participated in this two-week summer experience. Family Medicine Externship Program - A total of 6 students participated in a summer experience of two to four weeks for a total cost of $4,750.00. The Foundation was able to secure grants from the AAFP Philanthropic Consortium of $3,750.00 to offset some program expenses. Family Medicine Interest & Scholars Program - In 2013, the Scholars aspect of the program remained at 36 students. During this year a total of $124,265.00 was paid directly to and/or for students and preceptors. This included stipends awarded to students and preceptors totaling $59,125.00. Additional support to student participants in this program included: $11,239.00 to attend the NCAFP annual meeting; $13,416.00 for AAFP National Conference for FM Residents & Medical Students; $2540.00 for the Leadership Elective; and, $3,355.00 for travel to other national conferences. An additional $12,090.00 was paid for CME registration fees paid for preceptors at our Annual Meeting. Last, $22,500.00 was paid out for initial scholarship payments for students from the inaugural class of Family Medicine Scholars that matched into Family Medicine. From that inaugural class, of the ten that entered the MATCH in 2013, five selected the specialty of Family Medicine. Four of the remaining five entered other specialties of need in NC (psychiatry, med/peds, ob/gyn and general surgery). Those entering Family Medicine residency programs include: Kathryn V. Lawrence (WFSOM) - Wake Forest Baptist Medical Center - Winston-Salem, NC William Martin (UNC) - Greater Lawrence Family Health Center - Lawrence, MA (4-year program)	Brian P. Sanders (WFSOM) - Oregon Health and Science University - Portland, OR (4-year program) Daniel J. White (UNC) - Univ. of Colorado SOM - Denver Health Track - Denver, CO Patrick S. Williams (ECU) - CMC-Northeast Medical Center / Cabarrus - Concord, NC NCAFP Student Scholarship/Loan Program - Ms. Sophia Malik (UNC), now entering Family Medicine training in Seattle, WA, was awarded a scholarship in the amount of $2,000.00. North Carolina Tar Wars Program - The mission of Tar Wars is to educate students about being tobacco free, provide them with the tools to make positive decisions regarding their health, and to promote personal responsibility for their well-being. This program continues to be presented to NC fourth- and fifth-graders by student members of the state’s Family Medicine Interest Groups, as well as other healthcare professionals around the state. Rylie LaRue, of Sparta, NC was selected as the 2013 State Tar Wars Poster Contest winner. Rylie and her family went to Washington D.C., to participate in the Tar Wars National Conference. Top of Mind: ICD-10 TOP OF MIND: ICD-10 We recognize that we are not ICD-10 experts; The U.S. Department of Health and Human however, we thought it would be helpful tothe Health The U.S. Department of Health and Human (HHS) has designated ICD-10 as a code set under Services (HHS) has designated ICD-10 asServices a Insurance Portability and Accountability Act (HIPAA). Physicians other health care providers willcare be required to use compileand resources available to health code set under the Health Insurance Portability effective October 1, 2015.Physicians and providers on this daunting issue. While we may andICD-10 Accountability Act (HIPAA). not be in a position to address all of your ICDother health care providers will be required to As you are undoubtedly aware, in comparison to previous HIPAA mandates, the transition to ICD-10 is expected to be 10 questions and concerns, please have peace use ICD-10 effective October 1, 2015. most disruptive for physicians, as they are required to adjust documentation and other processes. Previous HIPAA of mind knowing that we are working with the mandates have allowed physicians to rely on billing services, vendors, and other partners; however, ICD-10 will involve a As you are undoubtedly aware, in comparison North Carolina Medical Society (NCMS) and much higher level of direct physician involvement. to previous HIPAA mandates, the transition to other organizations to identify and develop ICD-10 is expected to be most disruptive for Medical Mutual has heard from a number of our insured practices thattothey are seeking training in order for to prepare for the resources support a smooth transition physicians, they aretorequired to adjust transition as from ICD-9 ICD-10. Some havedocuhired outsideour consultants have expertise training for various insured that medical practiceswith andICD-10 physician medical and specialties, while others have attended educational seminarsThe offered by thewebsite American Academy of Professional mentation other processes. Previous HIPAA members. NCMS currently Coders (AAPC), the American Academy of Ophthalmic Executive (AAOE), and the Medical Group Management mandates have allowed physicians to rely on features a comprehensive list of ICD-10 Association (MGMA). Based the cost and complexity to implement ICD-10, training is imperative in order to prepare for billing services, vendors, andon other partners; learning opportunities. the changeover to code sets for new diseases and procedures. This conversion means that health care providers and however, ICD-10 will involve a much higher insurers will have to replace the approximately 14,000 existing codes with roughly 68,000tonew Medical Mutual is sensitive thecodes. impact that level of direct physician involvement. the ICD-10 delay has had on medical pracWe recognize that we are not ICD-10 experts; however, we thought it would be helpful to compile resources available to Medical Mutual has heard from a number of our tices is undoubtedly health care providers on this daunting issue. While we may not and be inphysicians. a position to This address all of your ICD-10 questions insured practices that they are seeking training a cumbersome process. Please and concerns, please have peace of mind knowing that we are working withand the costly North Carolina Medical Society (NCMS) in order to prepare for thetotransition ICD-9 the MedNotes blog to view periodic and other organizations identify andfrom develop resourcesvisit to support a smooth transition for our insured medical practices to ICD-10. Somemembers. have hired consul-currently features updates on this issue.list of ICD-10 learning opportunities. and physician Theoutside NCMS website a comprehensive tants that have expertise with ICD-10 training is sensitive to the impact that the ICD-10 delay has had oninformation, medical practices andatphysicians. This is For additional visit us www. for Medical various Mutual medical specialties, while others undoubtedly a cumbersome and costly process. Please visit the MedNotes blog to view periodic updates on this issue. medicalmutualgroup.com or call us at: have attended educational seminars offered by 800.662.7917 the American Academy of Professional Coders For additional information, visit us at www.medicalmutualgroup.com or call us at: 800.662.7917 (AAPC), the American Academy of Ophthalmic Executive (AAOE), and the Medical Group Management Association (MGMA). Based on the cost and complexity to implement ICD-10, training is imperative in order to prepare for the changeover to code sets for new diseases and procedures. This conversion means that health care providers and insurers will have to replace the approximately 14,000 existing codes with roughly 68,000 new codes. Kanof Institute for Physician Leadership Advisory Board. These groups are collaborating to lead a pilot program to provide physician members with more QI training. I partnered with Anita Schambach, director of Community Care Partners of Greater Mecklenburg and Dr. Janice Huff, faculty member at the CMC Family Medicine Residency in Charlotte. The emphasis of the program is on patient self-management support with their medical problems, and incorporating these goals into the primary care office visit. This is accomplished through a team-based approach, utilizing motivational interviewing skills and community resources; hoping to improve person-centered care. Ultimately, I would like to help design a longitudinal curriculum in QI in the residency program, incorporating additional didactic training and QI projects to improve patient care. These are just a few of resident education experiences going on in our state; hopefully we can hear about more in other programs in the coming months. North Carolina is a great state for Family Medicine training; the future is bright and full of innovation. We are fanning the flame of education to produce the doctors that are needed to take care of our patients and our communities. Triad HealthCare Network ACO Shows Promise Family Medicine and Primary Care Occupy Key Leadership Roles As the saying goes – ‘if you’ve seen one accountable care organization (ACO), you’ve seen one accountable care organization.’ But while every ACO in our state is “homegrown” in its particular population and faces its own challenges as well as advantages, some transcendent lessons can be gleaned from each unique situation. Triad HealthCare Network (THN), based in Greensboro, for example, may be considered distinctive because of its relationship with the local hospital and employed physician network at Cone Health. “Cone was masterful in their approach,” said Steve Neorr, vice president and executive director of THN. “Cone fully let physicians lead and drive this.” The relationship between doctors and the hospital network, however, wasn’t always so trusting. Starting back in 2010, the real work began to create this successful partnership, which has proved itself through successful care management initiatives and shared savings through the Medicare Shared Savings Plan. THN was, in fact, the only ACO in North Carolina to exceed the threshold to achieve shared savings for the latest financial report from the Center for Medicare and Medicaid Services (CMS) in February 2014. At first, though, it was just a group of three doctors who realized that health care as they currently were delivering it was not sustainable as to cost, access and quality. They believed that developing a local network based in the PiedmontTriad area to serve patients and promote cost-efficient, high-quality health care across the broad provider community was key to the future of health care. PRACTICE BRIEFS New 90-Day Rule Extends Time Services are Deemed Covered When Premium Payment Lapses Occur Family physicians and their practices should be aware of new regulations within the Affordable Care Act (ACA) that extend the time services are deemed covered when there is a lapse in payment of the insurance premium. This new rule only affects those patients who receive tax subsidies to purchase insurance plans through the health insurance marketplace. Known as the 90-Day Rule, the provision extends the grace period for patients to zero-out any past insurance premiums owed prior to coverage being terminated. Family Medicine practices should review their current policies and procedures regarding eligibility as a result of this new rule. The AAFP has published an excellent FAQ located at http://www.aafp.org/dam/AAFP/documents/practice_management/payment/90DayFAQ. pdf. Additional background information can be found at http://www.aafp.org/news/ government-medicine/20140326cmsgraceperiod.html. NCQA Releases New Version of PCMH Recognition Standards The National Committee for Quality Assurance (NCQA) released its latest generation of NCQA medical home standards, PCMH 2014. The new standards are the third iteration of the NCQA medical home program since 2008. Currently, over 10 percent of U.S. primary care practices are PCMH-recognized by NCQA. According to NCQA, PCMH 2014 retains the strengths of earlier NCQA standards, including alignment with contemporary federal requirements for “meaningful use” of health information technology-now Meaningful Use Stage 2. PCMH also promotes further integration of behavioral health, includes more care management focus on high-need populations, enhances emphasis on team-based care, and works to align improvement efforts with the triple aim. A copy of the new standards can be downloaded at http://www.ncqa.org. AAFP’s New PCMH Planner Offers Medical Home Roadmap The AAFP has created the PCMH Planner, an interactive online tool, to help family physician practices successfully transition to a patient-centered medical home model. Tracey Allen-Ehrhart, manager of the AAFP’s center for quality, said the planner concept came about after 2012 data showed only about 24% of family medicine practices had achieved official PCMH status. The planner was created to help physicians and staff members sharpen their PCMH focus and then take the right steps, at the right time, to achieve medical home practice transformation. The cost of the planner depends on the number of users in a practice, as well as whether or not a physician within your practice is an AAFP member. Pricing is based on a two-year subscription. For instance, an AAFP member practice with one user pays $99.95, a practice with two to five users pays $149, and a practice with six to 10 users pays $249. Those considering whether to invest in the PCMH Planner should note that it is compatible with mobile devices; however, creators agree that content is best viewed on larger screens. 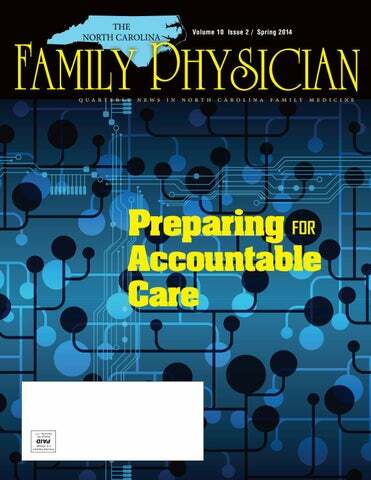 See http://www.aafp.org/news/practice-professionalissues/20140319pcmhplanner.html for additional information. Curious About Electronic Cigarettes? -- NC DHHS Information Provides Some Key Facts With the popularity of e-cigarettes seemingly growing by the day, physicians and health providers need to get up to speed on how they can impact the health of their patients, especially those looking to quit. NC DHHS distributed a short fact sheet earlier this year providing some excellent information that can answer some common questions. Members can download this information from the NCAFP website at www.ncafp.com/e-cigs. In January, the AAFP also released its official policy position on e-cigarettes and called for rigorous research in the form of randomized controlled trials of e-cigarettes to assess their safety, quality, and efficacy as a potential cessation device. It also recommended that the marketing and advertising of e-cigarettes, especially to children and youth, should cease immediately until e-cigarette’s safety, toxicity, and efficacy are established. AAFP’s policy can be read at http://www.aafp.org/about/policies/all/e-cigarettes.html. PHYSICIANS NEEDED FOR OUTPATIENT EXAMS Tri-State Occupational Medicine, Inc. (TSOM) is looking for physicians to join their group to perform disability evaluations in their NC ofﬁces. Part-time opportunities. No treatment is recommended or performed. No insurance forms. No follow up. No call, no weekends and no emergencies. Physicians working for us have various backgrounds and training. Training and all administrative needs including scheduling, transcription, assisting, and billing are provided. Must have a current NC medical license. TSOM has an excellent reputation for providing Consultative Evaluations for numerous state disability ofﬁces. Contact: Susan Gladys 866-9298766 / 866-712-5202 (fax) / susang@tsom.com. compiled by Merritt, Hawkins & Associates, FPs have remained the most recruited physicians of any specialty by hospitals, medical practice groups, or other health care organizations for almost the past decade. This is because regular primary care has been shown to improve health outcomes at lower costs and, more importantly, a FP who can manage a diverse patient population, navigate a variety of settings, and offer the majority of necessary care without referral or consultation can reduce the fragmentation of health care—all with a personal touch that our patients value. A narrowing scope-of-practice is not only bad for healthcare, but also bad for physician well-being. This is because a variety of patients, cases, services, and settings (i.e. clinic to hospital, nursing home, ED, etc.) can serve as relief from the monotony of complex, chronic disease management and can prevent disinterest or physician burnout. Unfortunately, the scopeof-practice of FPs is eroding away before our very eyes due to the convergence of many different factors, including healthcare reform, team-based care models with increased utilization of mid-level providers, the current fee-for-service reimbursement scheme, increasing patient load, and an aging population amongst many others. If we are to preserve the field of Family Medicine, we must investigate this topic further and find a way to balance between accommodation of a dramatically increasing patient load through delegation of responsibilities in a teambased/PCMH model and the personal and economic value of a meaningful, intimate, and consistent relationship between a full-scope FP and his/her patients, forged through continuity of care for those patients across various settings, circumstances, or particular service needs. Sources: http://www.aafp.org/medical-school-residency/choosing-fm/value-scope.html http://www.hrsa.gov/advisorycommittees/bhpradvisory/cogme/Reports/ twentiethreport.pdf Warren P. Newton, MD, MPH, Chair, ABFM. “Family Physicians and Scope of Practice: What We Know, Why It Matters…” February 25, 2012 Fraher, Erin, PhD MPP. "Trends in the Supply and Distribution of Obstetric Delivery Providers in North Carolina." Program on Health Workforce Research & Policy, Cecil G. Sheps Center for Health Services Research, UNC-CH. Joint Legislative Oversight Committee on Health and Human Services, Subcommittee on Midwives. Raleigh, NC. 26 Feb 2014. ABFM Website: http://www.certificationmatters.org/abms-member-boards/familymedicine.aspx AAFP Member Blog “Having Your Say on the Future of Family Medicine: AAFP Calls for Member Input.” http://www.aafp.org/news/opinion/20130910ffm2.html TCS Healthcare Technologies. 2012 Health IT Survey. “Trend Report #7: Caseloads.” http://www.tcshealthcare.com/index.php?q=Trend-Report-7 “Estimating a Reasonable Patient Panel Size for Primary Care Physicians With TeamBased Task Delegation.” Altschuler, MD, Margolius, MD, Bodenheimer, MD, and Grumbach, MD. Center for Excellence in Primary Care, Department of Family and Community Medicine, University of California, San Francisco. San Francisco, CA. Ann Fam Med 2012;10:396-400. doi:10.1370/afm.1400. Advocacy continued from p. 5 Academy. Legislators do listen to their local constituents and one of the most respected individuals from their district is the legislator’s own personal hometown physician. I am asking those readers that personally know a Representative/Senator to contact that individual over the next several weeks on behalf of the Academy to advocate for CCNC, the Medicaid program, and the other pertinent issues. The Academy can supply you with informational packets outlining the issues, as well as suggested responses. If the Academy office is given advanced notice of your visit to the legislature to meet with your local legislators, arrangements can be made for Academy staff to meet you and provide you with the materials you need for your visits, as well as suggested tips for the advocacy process. Mid-Summer continued from p. 12 Treatments, Male Hormone Replacement Therapies and much more. The week at the beach is packed with additional CME opportunities and family fun. Attendees can also sign up for optional workshops including Advanced Hands-On Procedures featuring Joint Injections & Aspirations; a Nexplanon Training workshop; and a satellite lunch on Understanding Legal Tools: The Key to Lawsuit Prevention & Tax Reduction. Get the family going early Tuesday morning with a One Mile Fun Run on the beach and enjoy a night out on Wednesday with discount group tickets to the Carolina Opry's Good Vibrations, a live must-see high energy music show, perfect for all ages. rangements will also be made for individual meetings with your local legislators. Finally, I must ask you to seriously consider contributing to our political action committee— FAMPAC. I have detailed on several occasions how our contributions to FAMPAC have significantly lagged behind other organizations such as the Chiropractors, Trial lawyers or other MD groups such as the Anesthesiologists. FAMPAC funds, while not directly influencing legislators, do help you to access legislators and get their attention so that you can detail our issues. I ask you to donate at least $100, preferably a dollar a day amount for a ($365) or even more. With the legislative elections this fall, those PAC funds are needed NOW as part of our advocacy efforts. Please contact Academy staff to arrange your contribution. Or contribute online by visiting www.ncafp.com/fampac. tion is available online and via a fill-able PDF form that can be emailed, faxed or mailed with payment. Registration options vary and offer flexibility and savings. The Midsummer Family Medicine Digest will include a free interactive and fun Mobile App (paper syllabus is available by purchase), while those attending the one-day Sports Medicine Symposium will receive a complimentary paper syllabus and a web address for online materials. CME credit has been filed with the AAFP and determination of credit is pending. The NCAFP is also recognized by the Board of Certification, Inc. to offer CE for Certified Athletic Trainers. Please contact the NCAFP Meetings Department at 919-833-2110 or by email at meetings@ncafp.com for more details. We look forward to seeing you there! the region now has a stronger network of primary care practices. The Collaborative was chosen from more than 70 submissions from around the U.S and was judged on five criteria: the ability to address long-standing issues of prevention or treatment, 2) transferability to rural and economically distressed regions of North Carolina, 3) consistent with high-impact work in other rural places, 4) potential for impact within three to five years, and 5) signs of success.